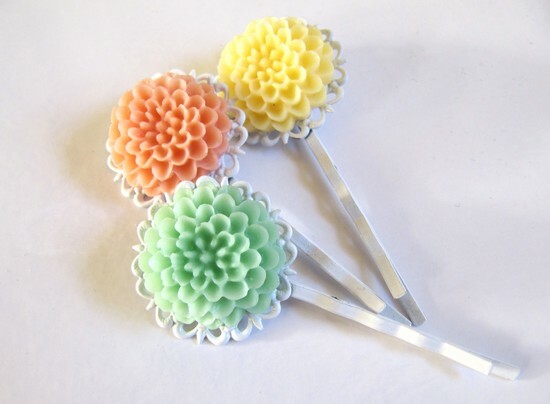 Ages ago, July to be exact, I received lots of packets of acrylic flowers, clips and brooches to start whipping up some Spring jewellery. As Winter dragged on and on these flowers ended up in a box in my craft room and were promptly forgotten. Today being so pretty and ‘Springy’ I remembered them and have started to make some jewellery. These are just simple clips, but I have plans for earrings, necklaces and bracelets which will be a good way to use up all the boxes of jewellery findings I have around the house. Today was also a perfect day for some Spring cleaning and my husband started to paint our deck. I think it’s going to look good, a pale grey rather than the red-brown it was. For all those on the east-coast of Australia – I hope you aren’t too thrown out by daylight savings beginning! It is lovely to have some extra daylight on such a nice day. I’ve got the snags on the barbie! I’m enjoying reading everyone’s Blogtoberfest entries, although I haven’t made it quite through the list of participants yet. I’ve set up a new category on my feedly called ‘Blogtoberfest’ so I can go straight to those blog entries each day. How are you keeping track of everyone? The white base clips are really pretty with the acrylic flowers on top. It’s amazing what supplies you find in the stash sometimes!